Transform your smart styles into powerful statements with this stunning jacket by Basler. 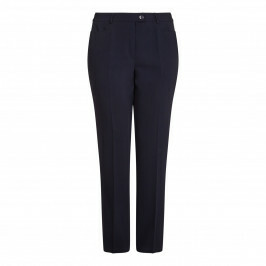 We love the fitted shape, emblem button and flap pockets with an overall flattering silhouette. Ideal for wearing to work with matching trousers. Fully lined, single emblem button, navy fitted jacket with four-button sleeve detail and side slit pockets with faux leather trim. 77% Viscose, 14% Polyamide, 9% Elastane. Fabric 2: 70% Polyurethane, 30% Polyamide. Lining 94% Polyester, 6% Elastane. Dry Clean Only.